Classic legend Minesweeper game now has a new mode with Windows 8, the Minesweeper game Adventure mode from Microsoft for Minesweeper game lovers. You control an adventurer who reminds me Indiana Jones and is looking for a secret treasury under earth deep in mines. Instead of mines that you should avoid in a classic Minesweeper game, there are traps this time you should keep away. And also developers of the Minesweeper Adventure mode have placed different creatures and monsters you should use specific weapons and tools to kill them. But to have those weapons for prehistoric creatures, you should seek and find those weapons in the mines just like searching mines in classic Minesweeper game. Besides struggling with creatures and avoding traps to reach doors and secret passages between levels, the players can also collect golds or coins to get more points for higher scores. I've been playing Minesweeper Adventure mode for a while on my Windows 8 computer and I liked playing it much. There is a story behind it. There are new levels to complete and it is different than the usual Minesweeper game board. And perhaps just like the flower garden mode of Minesweeper for children, the Adventure mode can also be used for Minesweeper game to be loved and played by kids. For example, recently I found my daughter playing the Minesweeper Adventure mode when I came home from work. I believe that Minesweeper game is an educational game for kids. So adventure mode is a good chance to make this game to be loved by kids. 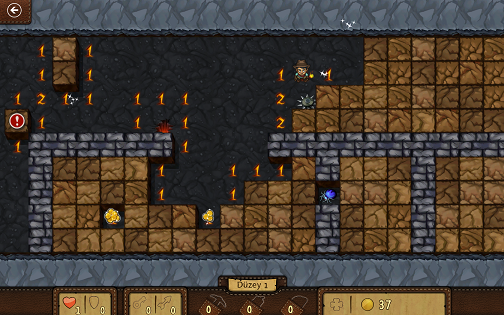 Minesweeper Adventure mode is a new option which will make Minesweeper game players happy. In this game mode just like in many other adventure games, players collect many tools that will help them to get to the next level. And while trying to solve the puzzle and jump to the next level, you collect coins and golds kept in treasury chests. Of course there will be obstacles that you should avoid and beat like the hidden traps (just like mines in classic Minesweeper game) and creatures. What makes players think Minesweeper Adventure mode is a version of the classic Minesweeper game is the squares with numbers in them. These numbers in empty squares indicate the number of traps surrounding that square. You can see the squares with numbers indicating traps around them. On the left most of the screen, you will see a square with red exclamation mark. This is a flag identifying a trap just like flags used to mark hidden mines. You can also see two traps which failed our hero Indiana Jones and lost two lives of beginning 3 lives. First trap is a deep hole with boiling lava and seconf is a banch of knives turning around a wheel. You can see your number of lives on the bottom left corner of the game screen. You can also see the coins and golds that will gain you additional points if you collect them. I'm sure one of the other interesting new obstacles in Minesweeper game Adventure mode is the creatures. You can see one that is closing the way to a hidden room in the mines. There are other things that you will collect and those things will help you in that level to reach the final passage to the next level in Minesweeper Adventure mode. These are keys to open doors and pass from one room to another. Arrows and knives that will help the adventure guy to eliminate monsters and creatures. Dynamites and mattocks to remove stones and rocks that are closing the ways.